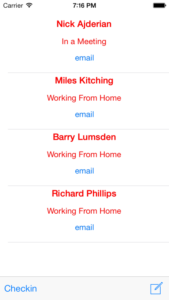 Use Survitech Checkin to tell your colleagues where you are and what you’re doing. 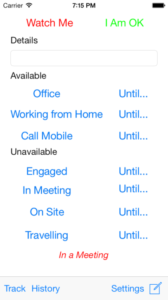 This app tracks users’ availability for a call centre. There’s a rich set of permissions to determine who can see whose availability. The iOS app and HTML app both allow users to clock on and clock off. 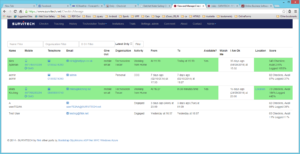 Users with View permissions can see who is on-site.